So, you've decided to set up an aquarium. You've picked out the tank, and read all about filtration. Seemingly, the last piece of the puzzle is to choose the type or kind of pump you need to make everything work. While that may seem like an easy question, with a simple answer, you go to some web site or store that sells pumps for aquariums and there are only about a million models to choose from. How do you know which is correct for your needs, your aquarium, your system? The first question you'll likely have is, "why do I need a pump?" The answer is simple. You have to circulate the water in your aquarium through your filter to keep the water sufficiently clean so your fish will actually live. The second question will likely be, "Do I need an air pump or a water pump?" The answer might very well be, "Yes - both!" The simplest use of a pump is found in a system that uses an undergravel plate for filtration. Connecting an air stone to the end of a tube whose other end is connected to an air pump is one way to circulate the water. This is the most economical way to ensure that water moves through your aquarium thereby creating a beneficial environment for your aquatic pets. Further, should you choose to include any of those cute decorations that make bubbles and move around in your aquarium, they too must be connected to an air pump. So what size air pump do you get? 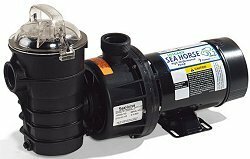 Air pumps are rated in flow rates appropriate per aquarium size in gallons. If the pump's sole purpose is to push water through an undergravel filter plate, then simply match the size of the aquarium to the rating of the pump. If you intend to add additional aquarium toys, decorations, or air stones that require additional flow capacity, choose a pump that is rated for a larger tank than the one you have so there will be an excess volume of air available for these other uses. If you are using a tank with a full hood, the amount of oxygen at the surface of the water (where oxygenation of the water takes place) may be reduced because of the lack of air mass under the hood. This is a place where an air pump with an air stone that agitates the surface of the water will help the tank. Air pumps used where an undergravel filter is the only means of filtration should be limited to aquariums no larger than 30-40 gallons. Large tanks take more and stronger pumping than just rising bubbles can provide. Undergravel filter plates can also use water pumps (powerheads) to circulate the water. Powerheads attach to the plastic tubes that attach to the undergravel filter plates (where the air stone is attached in the example above) and either pull or push the water through the tubes. Manufactures of powerheads rate their "pumps" based on gallons per hour (GPH). A rating of 120 GPH means that the pump will move 120 gallons of water in an hour. Should you choose a powerhead instead of an air pump and air stone to "circulate" the water, you will be required to have some additional information to make the correct choice for your system. Generally speaking, powerheads are somewhat more expensive than air pumps. However, powerheads can help to create more current movement in the tank, bringing water from different levels of the tank and helping to prevent "dead" spots that are hard to circulate, making them more advantageous than most air-stone-driven filtration. 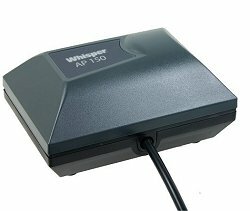 Additionally, air pumps are devices used outside the aquarium, and can add to environmental noise, while powerheads are used inside the aquarium (submersible), quietly. Powerheads do warm up the water a little. If either noise or a small amount of heat is a consideration in your system, such consideration might factor into your decision. To determine the correct powerhead for your system know that most experts conclude that a healthy environment requires that the water be completely circulated at least five to six (5-6) times an hour. 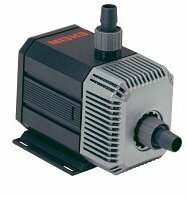 Therefore if your aquarium is 20 gallons, you should choose a powerhead that will pump 20 gallons times 5 (20x5) or at least 100-120 GPH. Choosing a powerhead that moves as much as 10 times the actual water volume of your aquarium is certainly acceptable. Aeration is important to both fresh and marine tanks. Most aeration takes place at the surface of the aquarium and can be provided either by the flow from a the rising bubbles of an air stone or the agitation from a powerhead. Freshwater aquariums should be relatively placid, without strong currents because most tropical fishes come from calm waters. However, marine coral reef fishes and invertebrates come mostly from strongly moving water with vigorous natural aeration. They prefer aquariums with high-flow water pumps providing strong water agitation in order to have sufficient oxygen. There are newer wave-making systems that incorporate small pumps positioned around the aquarium that can be programmed to produce variable directional water flow to simulate wave or tidal cycles that stimulate reef inhabitants. They are not directly related to the filtering process, but are extremely beneficial to reef tanks. To choose the size of those pumps is fairly arbitrary and determined by the strength of the currents you want to create. The size and type of pumps as well as the type and material of the air stone are important considerations. Should you decide to use a powerhead, you might then ask, "Do I still need an air pump?" The answer could be, "yes" if you still want to use decorations or toys or air stones that require the movement of air to work, then an air pump is still necessary. 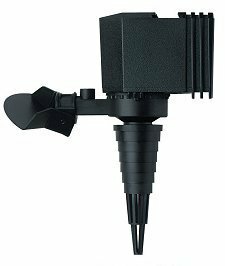 If the use is limited solely to filtration, use of a powerhead eliminates the need for an air pump. So what if you're not using an undergravel filter plate in your system but some other type of filter? If you choose a more sophisticated filter like a canister, power, or wet/dry system or you need a pump for your pond, you may be looking for water pumps to power these filter systems. You will be asked to choose between an external pump or an in-line pump. External pumps are not sealed and must be used in a dry environment, while "in-line" pumps can be submersed in water and are usually housed in the canister or sump of the filter and in the depths of the pond. Internal pumps make less noise, but create more heat. External pumps are usually used with pond filters. Many pond filters sit inside the pond and have an external pump that brings water from the pond, through the filter and pushes it back into the pond. Rule of thumb is to use the mathematical formula for GPH and take into account any need to push water uphill (head pressure). The accompanying literature of most good pumps will give you the flow rate reduction for varying feet of head pressure. For example, a Danner pump that has a 500 gallon/per/hour capacity is reduced to 300 GPH when required to push the water up for a distance of 4 feet (the usual approximate distance from your canister or sump to the tank). The most common pumps for canister and wet-dry filters are submersible, in-line pumps. Canister and power filters usually contain their own pumps, already rated by the manufacturer to work efficiently in the configuration they recommend. Choose a canister rated for the number of gallons the manufacturer recommends. They have already taken into consideration whether the canister will sit under the tank or hang on the tank etc. The same is true of power filters. An oversized pump can compensate for pressure lost in head height or turns in the plumbing. It can be adjusted down with ball valves. A pump that is too small cannot be enhanced. Therefore, if at all uncertain, choose the larger rather than the smaller pump. The last detail is to be certain that your pump of choice has fittings or can be adapted to accept the size tubing or hose you have purchased to connect your pump to the rest of the system. This is a relatively simple thing, but nothing is more maddening than getting your new equipment home ready to set things up and start them running, only to determine there are missing parts to the puzzle. Vinyl tubing is measured by its inside diameter (I.D.) Look for any unusual tubing requirements. Most water pumps come with adaptors to accommodate several sizes of tubing or they will tell you exactly what size you wil need.